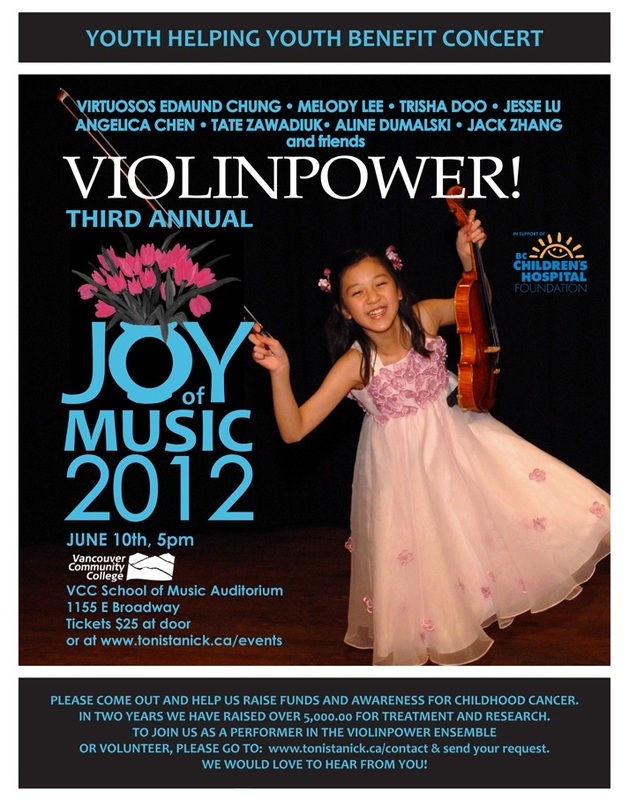 3rd Annual JOY of MUSIC 2012 Benefit Concert featuring VIOLINPOWER! 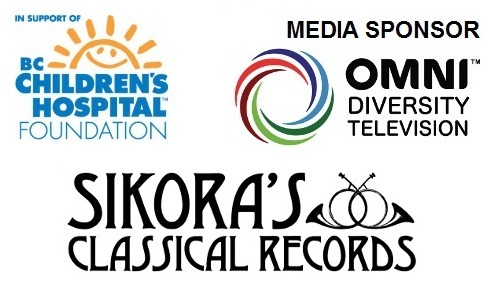 Sikoras Classical Records 432 W. Hastings St.
PURCHASE TICKETS EARLY, our last event sold out! "Toni! Your concert was outstanding! Your arrangement of Csardas was first-rate, in fact, it's the most effective one I've heard. The standing ovation was well-earned." Cam Trowsdale Concert-master of CBC and Vancouver Opera Orchestras. "JOY..was an exquisite concert with exceptional talent, genuine warmth and an inclusive atmosphere, congratulations on a most succesful 1st Annual JOY of MUSIC!" VIOLINPOWER is a highly regarded musical group which performs under the direction of world-class violinist Toni Stanick.We attended this event last year and we were blown away by the calibre of the performances, we thouroughly enjoyed the evening." "I look forward to JOY of MUSIC, last year's concert still remains as one of the stand out musical events that I attended last year." CBC STUDIO 700 700 Hamilton St.
COME CELEBRATE THE BLOSSOM AND THE BEAUTY! The Vancouver Cherry Blossom festival has commissioned a new orchestral tone poem to commemorate Vancouver's 125th birthday. 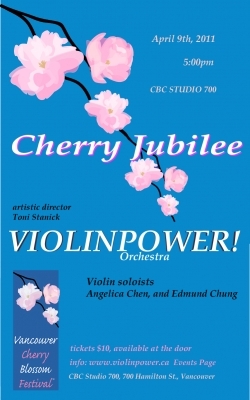 Inspired by the cherry tree, written by Toni Stanick and performed by the dazzling VIOLINPOWER Orchestra. "Blossom" is our birthday gift to the City of Vancouver. 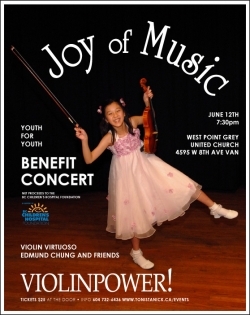 Come join VIOLINPOWER in a concert that will lift your spirits, dazzle and delight, and carry you away with the joyous outpouring of the budding brilliance of Vancouver's own young talent. Back by very popular and ever-growing demand, Edmund Chung violinist will perform the magnificent Brahms concerto, conceived in the Spring of 1878 and unfurling to completion in 3 short months it is a monumental work reaching the very peak of sprituality, the Bach Chaccone, a musical cathedral written after the death of his wife, this masterwork takes us on a journey to the depths of our soul, through loss, sorrow acceptance and finally the triumph of the spirit, and the Caprice #24 by Nicolo Paganini, a virtuosic display that will dazzle the senses as breath-taking as the sudden beauty of the cherry blossom. Cellist Luke Kim will join Edmund for the stunning Handel-Halvorsen duo the Passacaglia, an icon of the string repertoire, it will amaze and inspire. VIOLINPOWER Orchestra will perform, Greensleeves and the world premiere of Blossom. "The selection of music, the performance, the talented young musicians, their passion for beauty and music was all good for the soul"
VIOLINPOWER performs in true chamber-music fashion without conductor. Giving every performer the opportunity to lead, fuels the performance with a breath-taking quality of thrilling immediacy. With every member of the ensemble sitting on the edge of their seats, exchanging musical phrases, coming in and out of the texture, weaving harmony and dynamics,we create music that is truly alive! Come hear violinists from the very early stages as young as 6 through to the most advanced performers, including Edmund Chung performing Brahms Concerto and Angelica Chen performing Kreislers Praeludium and Allegro. From Go tell Aunt Rhody to Brahms Violin Concerto you will be enthralled and enchanted by the violinists of every age and ability. Hear Angelica in her canadian debut, only 11 years old and performing with grace charm, wit, and joyful enthusiasm, and the mature artist Edmund Chung, who is playing with power, artistry, and total command. Using the power of music to develop the idea of philanthropy in youth, the initiative YOUTH FOR YOUTH is a vehicle for music students to participate in organising events to raise funds for the bettermant of our community. 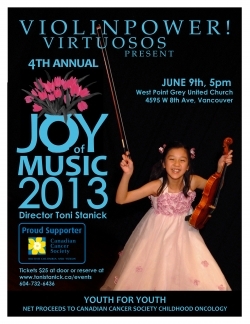 The JOY of MUSIC will bring together a group of more than 20 elite young Canadian virtuoso violinists, violists, cellists, and a bass, about to burst into the professional world of music.These young super talents will perform a benefit concert for BC Children's Hospital Foundation. The success of these young musicians include full scholarships to Yale, Colburn, and UVIC. They are National and Provincial champions and have appeared as soloists with numerous orchestras including the Vancouver Symphony and Mozart Festival Orchestra. The world-class Trio Accord will perform selections of Bach's Goldberg Variations and then join together with the virtuoso musicians of VIOLINPOWER for the exuberant and joyful Brandenburg Concerto #3. Originally a violin ensemble created to bring virtuoso players together, VIOLINPOWER will be augmented to a complete chamber orchestra with students from UBC and VCC Schools of Music, Vancouver Youth Symphony Orchestra, Vancouver Academy Symphony Orchestra and music programs throughout British Columbia. Mary Sokol-Brown violin, Andrew Brown viola, Ariel Barnes cello. One of Canada's top chamber ensembles, their debut album on Skylark records of J.S. Bach's Goldberg Variations (2008) was nominated for Classical Record of the Year at the Western Canadian Music Awards. Residing in Vancouver, they perform throughout the Lower Mainland and recently performed as return guests at the Northern Lights Music Festival in Ajijic, Mexico. Adora Wong age 17, is a grade 12 student at York House completing a full academic program,.Fluent in three languages, Adora was able to spend last summer in Montreal working with underpriveleged new immigrant women and children conversing only in French! Adora has been accepted at both McGill and UBC Schools of Musicon scholarship, and currentlly plays concertmaster for the Vancouver Academy Symphony Orchestra. Julie Kennedy recieved a Bachelor of Music with Honours from the University of Victoria on a full tuition scholarship. Two summers ago she was concertmqaster of the National Youth Orchestra of Canada, where she won an outstanding leadership award for her amazing talents and abilities. She presently performs as an extra with the Victoria and vancouver Symphonies, and with her twin sisterCarli, on guitar they compose and perform their original music. They have released a cd "Carli and Julie Kennedy" available at Long and McQuade. Edmund Chung, age 19 is a seasoned performer who has won many accolades and competitions including 1st Place at the prestigious Canadian Music Competition in Quebec City, 2008, and 1st Place British Columbia Provincial Competiton. Edmund has appeared as soloist twice with the Vancouver Symphony Orchestra. His early training took him to New York where he studied at the JuilliardSchool of Music pre-Colege program for gifted youth. Melody Lee, age 19 has just completed her 3rd year on a complete full scholarship in Los Angeles at the prestigious Colburn School of Music. She has appeared as soloist with the vancouver Symphony Orchestra, and Vancouver Youth Orchestra, performed numerous recitals and gala events as a soloist and chamber musiciananf for two years was Concertmaster of the Vancouver Academy Symphony Orchestra. This summer she has a fellowship to the prestigious Aspen International Summer program. Yujin Jung age 16 is a grade 10 student who excels not only in music but in math ans science.o stranger to the stage, she has won numerous competitions and scholarships and appeared in many gala events including the Cavalcade of Stars, Kiwanis, and for the Burnaby Clef. Please join us as we come together to share the beauty and power of music. You can join us as a performer, volunteer, usher, sponsor, you can collect pledges, or just come and experience the joy of music. Kendra James 3rd year BMus Colburn School of Music L.A.
Last night Melody Lee and Patricia Hoy brought down the house with a no-holds-barred Brahms that was lavish and truly exciting (keep your eyes open for the new release of Patircia Hoy and Alexander Soliemen due out this August he plays a cello transcription of the sonatensatz) followed by a Beethoven that was pure elegance, performed entirely by memory with grace and exemplary chamber music, between the two musicians. Melody opened the second half with flawless and perfectly paced movements from the Bach D minor Partitia, and ended the recital with a spectacular breathtaking Scherzo Tarantelle. Melody's combination of speed, precision, beauty, and bold virtuosic technique, brought the crowd to their feet in a warm and vocal standing ovation!! Not only did Melody perform beautifully, but she was stunningly attired and has a compelling presence on stage. She is a talented young woman and we will watch for her as she blossoms into the professional world. Anthea Dolan "More than a violin recital!" "Toni Stanick's introduction to each composer was informative, interesting and brought each one to life and her obvious enthusiasm and love of each piece was contagious. Melody Lee is a joy to listen to and a joy to watch. Her performance of the Scherzo Tarantelle was mesmerizing and showed just how talented she is and deservedly brought everyone to their feet!" Deon Kopke "Wonderful evening, Beethoven's music is so grand and essential, let's do it every quarter!" Robert Byler "Superb concert, thank you so much!! Absolutely wonderful!" Mary McBride "Fabulous high-quality, magnificent! More concerts would be great!" Don Simpson "Delightful and very impressive"
Marlene McDonald "I am enjoying it VERY much...."
I am very happy to be producing this concert for Melody Lee. Two years ago, in January 2007, Melody attended a recital by another of my alumni, Jaewon Bang, who was also at Colburn. Jaewon was performing as soloist with The Mozart Festival Orchestra in California and asked if I could organise a concert for her as a dry run. Well..........this turned out to be an incrediable event. We were packed out and had to turn people away!! Jaewon was dazzling, and had everyone spellbound. When I met with Melody in the summer, she talked of this recital, and asked if I could put together a concert for her. I have known Melody for many years and it is a pleasure to watch her grow and develop, she has an exceptional talent, and it is already a violinist of note. I'm very excited to be bringing Patricia Hoy and Melody Lee together to weave wonderful magic, through the music of Bach, Beethoven, Brahms and the violin great Henri Wieniawski. This will be an amazing experience! Melody Lee, age 19, is currently a third year student of Robert Lipsett, on full scholarship at the Colburn School of Music in Los Angeles. 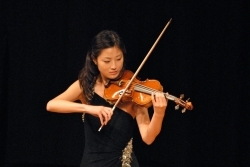 She is originally from Vancouver, BC, where she began studies in violin at age 6 with Erno Kabok, and from 1997 to 2007 under Toni Stanick, during which time she won many first place victories at competitions including Kiwanis, Coquitlam, Performers Guild among others, appered as soloist with both the Vancouver Symphony Orchestra and the Vancouver Youth Orchestra playing the Mendellsohn violin concerto, was a finalsit in the BC Provincial Open Category and a winner of the Burnaby Clef concerto competition. As a chamber musician, Melody and her trio won the Friends of Chamber Music Competition two years running and won scholarships from the Elsje de Ridder chamber music competition. Melody has played in masterclasses for Pinchas Zuckerman, Arnold Steinhardt, Sidney Harth and Vadim Gluzman. Melody also attended the Colorado College Summer Music Festival on full scholarship in 2006, and in 2009 spent her second summer at the Aspen Music Festival with an Academy of Conducting Fellowship. Pianist Patricia Hoy has been featured as a soloist with such orchestras as the Montreal Symphony, Vancouver Symphony, Quebec Chamber Orchestra, CBC Radio Orchestra and the Ventura Symphony. She has been a featured pianist on CBC, PBS and WCXR. As a chamber musician, she is frequently invited to collaborate on a wide variety of projects ranging from performances of the established repertoire to the commissioning and performance of new works by North American and European composers. For the 2009/2010 season she will be performing both as chamber musician and soloist in Canada, California, Alaska, and Germany. In addition to her performing career, Dr. Hoy has served as faculty and program coordinator at the Banff Centre for the Performing Arts. She is a faculty member at the Young Artists Experience a summer program designed to train and mentor gifted students. Dr. Hoy is also a member of the UBC Faculty of Music where she coaches and lectures on chamber music.